Meet Jen Lunsford at Edibles Tonight! I hope you will join me in stopping by Edibles at 704 University Avenue, to meet and support Jen Lunsford, our Democratic candidate for the 55th State Senate district. 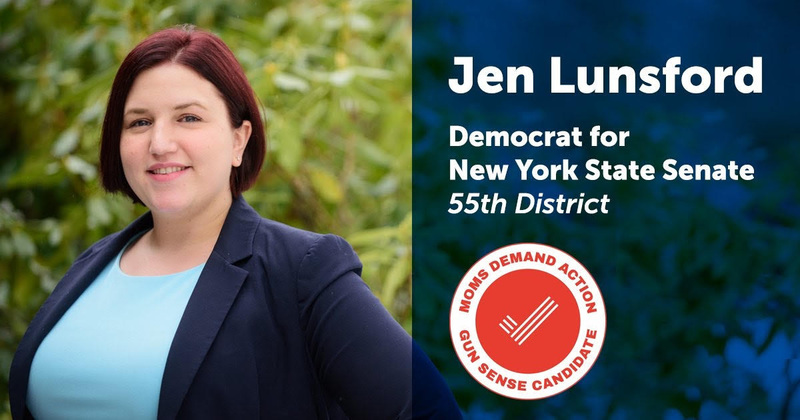 Jen recently received a “Gun Sense Candidate” rating from the Rochester Chapter of Moms Demand Action for Gun Sense in America. This would make sense, considering her opponent Republican State Senator Rich Funke recently voted against a bill to ensure that domestic violence offenders do not have access to firearms(S8121). Jen Lunsford is running to be an Upstate member of the new Democratic majority in the State Senate. We are extremely proud and excited to share in the kick-off of our Family Court candidate’s press conference this morning. Below is a copy of the press release we wanted to share with you. We hope you learn more about our candidates and their historic campaigns and support them. You can sign up HERE to volunteer to and stay in touch on their campaigns. Thank you! 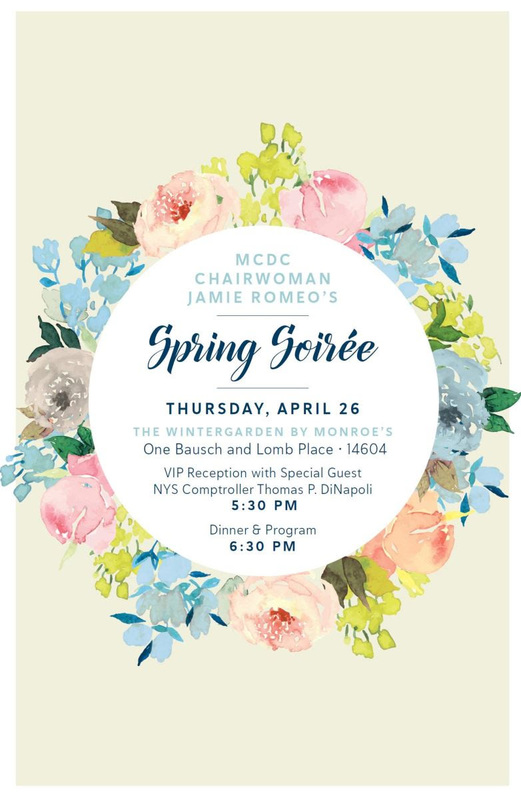 April 9th, 2018 (Rochester, NY) – MCDC Chairwoman Jamie Romeo, along with other Democratic Leaders and community members, proudly announced the historic candidacies of Ms. Zuleika Z. Shepard, Esq. and Ms. Fatimat O. Reid, Esq. for Monroe County Family Court today. Running for two open seats on Family Court, if elected these women will be the first women of color to be elected to Family Court. 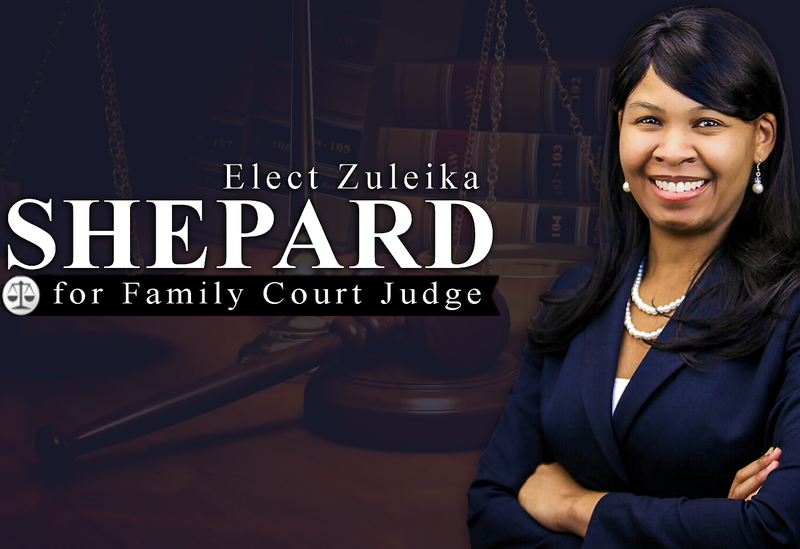 Zuleika Shepard is an experienced trial attorney, currently serves as a Deputy County Attorney for the Monroe County Law Department on behalf of assignors in paternity and child support cases in Family Court. Prior to that, Ms. Shepard served as an Assistant District Attorney at the Monroe County District Attorney’s Office, where she prosecuted hundreds of domestic violence cases and thousands of misdemeanor and violation cases throughout Monroe County. Ms. Shepard also served as Staff Attorney for the Capital District Women’s Bar Association: The Legal Project, where she represented women in domestic violence cases in Supreme Court, helping them to obtain divorces from batterers, and in Family Court, representing them in child custody and support, and family offense cases. Over the course of her career, Ms. Shepard has litigated approximately 320 criminal, civil, or family court trials or hearings, 270 of which ended in a decision or verdict, and 15 of which were jury trials. “I am running to bring a much- needed perspective to the bench. I can relate to many of the litigants and children who appear in Family Court. I was raised in a single parent home in the city of Rochester. My family lived “paycheck to paycheck.” I have sat in the same city school classrooms and walked the same neighborhoods as many of the children. I can understand the struggles that many of the urban youth face and I want to be able to show them that they can make it.” Zuleika Shepard stated. 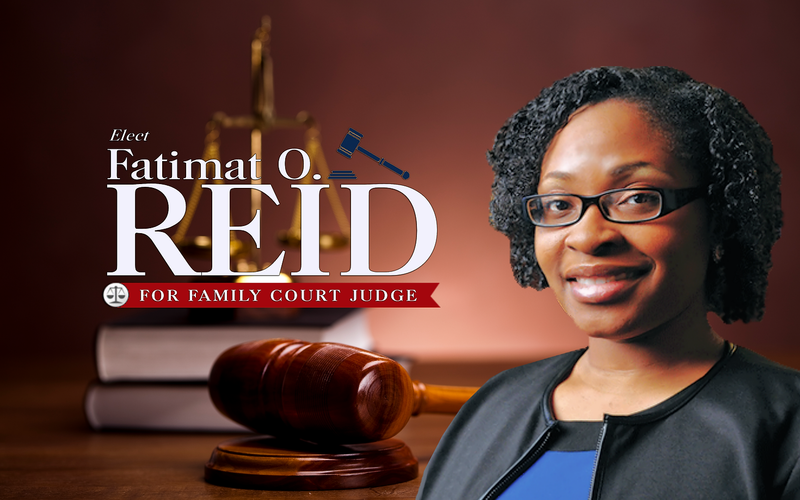 Fatimat Reid is a seasoned litigator, transactional attorney, and administrator who presently serves as Chief of Staff of the Rochester City School District. Before being promoted to Chief of Staff, Ms. Reid worked as an Associate Counsel in the Rochester City School District’s Department of Law, managing the district’s contracts and litigation. Ms. Reid previously served as a Municipal Attorney for the City of Rochester Corporation Counsel’s Office, overseeing the City’s contracts and litigation. Ms. Reid began her career as a litigation associate in private practice, working at the firms of Davidson Fink LLP and Wolpoff & Abrahamson LLP. Fatimat Reid received the 2013 “Top Counsel Award” from the Daily Record, the 2017 “Top Women in Law Award” from the Daily Record and the 2017 “40 Under 40” Award from the Rochester Business Journal. She was recognized in February 2018 as a “Woman to Watch” by the Democrat and Chronicle. “I am motivated by the Nigerian proverb “Ìlú tí a bá rè là ḿbá pé (Do not leave your people behind),” says Fatimat Reid. “While I was born in New York, I was raised in Nigeria and immigrated back to the United States at the age of ten, where I became the subject of a Family Court custody action and spent time in foster care. I had limited English proficiency and no exposure to American culture. I have a firsthand understanding of how frightening and frustrating the Family Court process can be for children and families, especially those who are particularly vulnerable due to poverty or their minority or immigrant status. We need judges on the bench who can bring their first-hand experiences into the courtroom to ensure that each child that comes before that court will have confidence that their best interests are taken in every decision. It has been over thirty years since a candidate of color was elected to any Monroe County judgeship, whether for Family Court, County Court, or State Supreme Court. MCDC is focused on making the higher courts of Monroe County more reflective of the litigants and general community served by those courts because diversity is a core tenet of New York’s Court System, and critical to the fair administration of justice. Diversity is also a core tenet of MCDC. When elected, Ms. Shepard and Ms. Reid will be the first African American women ever to serve on Monroe County Family Court. Both Ms. Shepard and Ms. Reid have been rated “highly qualified” by MCDC’s Judicial Selection and Screening Committee. Today you may have heard the news that the two factions of Democrats in the New York State Senate announcing their reconciliation. For years, a small group of Democratic State Senators have aligned with the Republican Conference, allowing them to maintain control over the upper chamber and what proposals can come to a vote. It has also allowed the Republicans to maintain significant power at the negotiating table over significant policies, like the State Budget. So what does that mean for us in Upstate New York? Ten years ago, the State Senate districts were redrawn to slice up Monroe County into 6 different senate districts. Only one (the 56th District, currently held by Sen. Joe Robach, a Republican) is completely within Monroe County. The remaining 5 include one or more of our neighboring counties. This has weakened our representation in the State Senate. Of the 6 State Senators that represent us, 2 live within our county. Three of those remaining (including one who represents a portion of the City of Rochester in the 61st District Michael Ranzenhofer, a Republican) live in counties that do not even border Monroe. So what does that mean for us? These districts were gerrymandered intentionally to make them difficult to run in against their Republican incumbents. However, over the past decade, something important has happened. More and more voters are becoming engaged with their political systems and more and more voters are enrolling in the Democratic Party. About 40.6% of all registered voters in Monroe County are currently registered Democrats. Today’s announcement means there will be a new majority in the State Senate, and we need to support and recruit local candidates to add and strengthen that majority. That’s why I hope you will come out to support our Democratic Challenger to Sen. Rich Funke in the 55th Senate District Jen Lunsford next week at her event on April 9, 2018, 5:30-7:30 PM at Edibles Restaurant & Bar, 704 University Ave, Rochester, NY 14607. Today’s front page of the D&C highlighted recent legislation that will allow authorities to remove firearms from domestic abusers. This would look, to most, like a common-sense piece of legislation that was supported by our local Democratic State delegation, also co-sponsored by Majority Leader Joe Morelle, and passed both houses with overwhelming support. But Senator Rich Funke voted against this bill. I’ll repeat, Senator Rich Funke (who received a 93% rating from the NRA in 2016) voted against a bill that ensures that domestic violence offenders do not have access to firearms. So I hope to see you on Monday, April 9th to come and meet Jen. Ask her questions, find out where she stands on the issues and how she will be able to bring the voice of Upstate New Yorkers to the new majority in the State Senate. Clearly, our current representatives have not been voting in our interest.